Le site de Koh Ker is part of the Tentative list of Cambodia in order to qualify for inclusion in the World Heritage List. Normally I try to stipulate the full itinerary of a day trip with a driver before I go. This time I didn’t and my driver notified me in Preah Vihear that Koh Ker wasn’t part of the trip. I was left somewhat annoyed, but couldn’t really complain as all I asked for was Preah Vihear. Koh Ker was just mentioned as an alternative when my driver was pitching me potential day trips back in Siem Reap. Coming down the mountain after my visit of Preah Vihear I had already prepared myself for major haggling. But this being Cambodia my driver asked for less than 20 USD as a starting bid. It was kind of cute and I just had to smile and said yes. Going to Koh Ker is at least a 1h detour and adds some kilometers to the tab. And I have to say the money was well invested. Koh Ker managed to surprise me as I suddenly felt beamed to Yucatan: a pyramid in the jungle! Thanks to the limited visitors you are even allowed to climb it and get a great view of the surrounding landscape (mostly jungle). It’s funny how these classical forms transcend cultures. Admittedly, due to the rather late hour and the tiring heat, I skipped on the other components of the site. I had already seen plenty of Khmer architecture when I came to Koh Ker. The site pales in size and artwork compared to Preah Vihear, let alone Angkor, but the pyramid felt different from those in Angkor and sufficiently unique. As stated I combined Koh Ker with Preah Vihear into a day trip with driver from Siem Reap. Looking at the remoteness of the site (at least that’s what it felt like) I am not sure how you would get here otherwise. Recommendation is to negotiate the full day trip before you go (Preah Vihear and Koh Ker). I went on a day trip from Siem Reap to 3 remote temples on one day with private car. 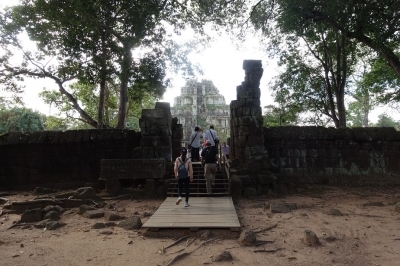 One of those temples was Koh Ker. The site has several small and bigger stops. From the ticket booth you drive a few kilometres to the main site (with the piramide). First you enter a complex of temples and other buildings, at the end is the piramide you can climb. After this main site you make a looping to see some small temples with lingas. On the way out many more smaller items, But also a beautifull location with 5 similar temples, two "eaten" by the trees.